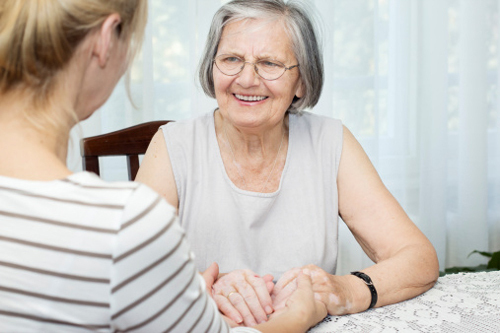 According to a new study published in the Journal of the American Geriatrics Society, little face-to-face contact with family and friends increases the depression risk for older adults. For the study, researchers analyzed data of 11,065 adults aged 50 and older who took part in the University of Michigan’s Health and Retirement Survey between 2004 and 2010. They wanted to find out how various methods of social interaction with family and friends impacted the risk for depression among the elderly. The team analyzed how often participants interacted with friends and family through four different types of social contact: telephone, in person, letter, and e-mail. Symptoms of depression for participants were assessed two years later. Researchers discovered that older adults who experienced little in-person contact with their friends and family almost doubled their risk of depression two years later. Furthermore, 11.5% of participants who had face-to-face contact only once every few months or less had symptoms of depression compared to 6.5% of participants who had face-to-face contact at least three times a week. The team also discovered that the frequency of written or e-mail contact had no effect on each participant’s risk for depression. In addition, the team assessed how depression risks varied by the certain types of individuals’ participants came in contact with. For adults between the ages of 50 and 69, frequent interaction with friends lowered their risk of depression. Adults aged 70 and older benefited more from face-to-face contact with children and other relatives. Results remained the same even after adjusting for factors such as health status, pre-existing symptoms of depression, and how close participants lived to their family and friends. Teo, A., et al., “Does mode of contact with different types of social relationships predict depression in older adults? Evidence from a nationally representative survey,” Journal of the American Geriatrics Society October 6, 2015, doi: 10.1111/jgs.13667. Whiteman, H., “Lack of face-to-face contact almost doubles depression risk for older adults,” Medical News Today web site, October 6, 2015; http://www.medicalnewstoday.com/articles/300521.php.